Check out what you have missed over the past decade. Not too bad of a list, nothing is ever going to be exactly what you want. After a five year hiatus, Julian Casablancas and The Strokes are back with their fourth studio album titled “Angles”. The band started working on this album with Joe Chicarelli, who in recent times has worked with The Shins and The White Stripes, which lead me to think that this may be a flop in the making. The album opens with the track “Machu Picchu” which gives the listener an immediate impression of what this album is about. The vocals are gentler, the guitars are warmer and the overall sound is full and mature from their earlier days as well as showing off a distinctly new direction, from a band that may be accused of being a little safe for the past two albums. Don’t be fooled by the tone of this review. If you are after an album which feels like “Is This It” well you will have a few tracks which are up are your alley, having said that though there will be people that I assume will find the follow on from “Phrases for the Young” (I don’t care how Julian spells the title, I refuse to use US English in MY review) a little too “poppy” for a want of a better word, with a lot less raw emotion put into the songs. The lead single “Under Cover of Darkness” had me a little confuzzled at first listen. I didn’t know what to make of it. The song felt a little confused itself and I didn’t know how to react. The more I hear this song, the more I love it. This is exactly the song that the alternative rock community needed to drag the kids away from the deamons of the garbage dance music that they listen to these days (end rant). The bass guitar work is fantastic throughout the album with the highlight being the “Taken for a fool”, but who would guess otherwise as Fraiture has always been a rock for The Strokes and doesn’t get the credit that he deserves. Even on this track you find your self getting dragged away that funky as bass sound and drawn into Casablancas’ vocal which is clearly showing off great flexibility from earlier works. I absolutely loved “Gratisfaction” from the first moment that I heard it. The song is chock full of fun and energy, it really makes it hard not to smile and tap away on the steering wheel as you drive along. The band then follows up with “Metabolism” which is quite chunky and brings back the Strokes sound of old, with that distinctive vocal taking control. The songs are well written with much of the bands signature drumming style and guitar sound surviving the groups extended vacation. 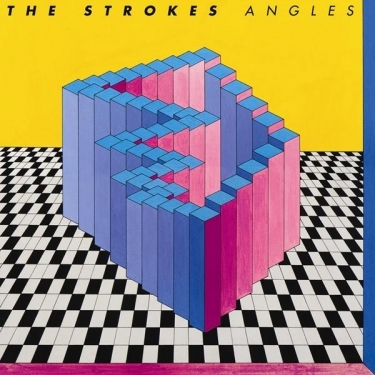 The sound is quite deliberate with no sense of fodder, the album title “Angles” suggests that Casablancas and co had a good understanding as to what they had created with this album. Parting was with their original producer didn’t phase them in the slightest. I am not going to say that this is the best Strokes album, having said that, it is their best. The have never displayed such range or maturity in their sound on previous albums in the way that they have here. The Strokes have never been a band that have demanded listeners to sit down and take a lesson in rock, but that is exactly what they are doing here. Not that the band demands much commitment to gain reward, it’s just that the sound is fuller and more layered than before. The band has taken a lot of ideas and managed to fit them into on album and make it work. There is some great funky sounds on this album with some really great guitar work and people wanting to judge them as past their best should give this a chance. This album gives me the impression that the band was trying to please too many people and comes off as somewhat disjointed from track to track, despite this though the sound is strong and as each song is enjoyable on its own you can easily get past the lack of flow. I think this comes down to the band not being certain about what they are after such a long lay off and side projects to boot. I must say I love this album and think that it will be tough to run this down in album of the year stakes. Unfortunately for some, Splendour in the Grass is returning to Woodford, Qld despite a large push to return the festival to the Byron Bay region. Lineup and ticket release are soon to follow. Foo Fighters are back and at it again. Not sure what to make of this track, but no doubt this will be another solid output from a veteran group.